100% cotton ‘Huck weave’ towels feature a strong light construction. They are pre-washed and treated for absorbency. 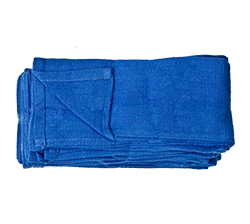 These towels are commonly referred to as “OR” towels due to their use in operating rooms. Sold by the bale featuring 8 poly bags of 50 fan folded towels. Also sold in a retail pack of 50.